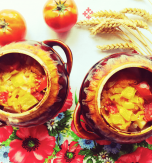 The Ukrainian tradition of cooking in pots comes back from our grandparents and great grandparents. They knew that the fish stewed in pots not only had a delish taste but preserved all the nutrients and microelements. 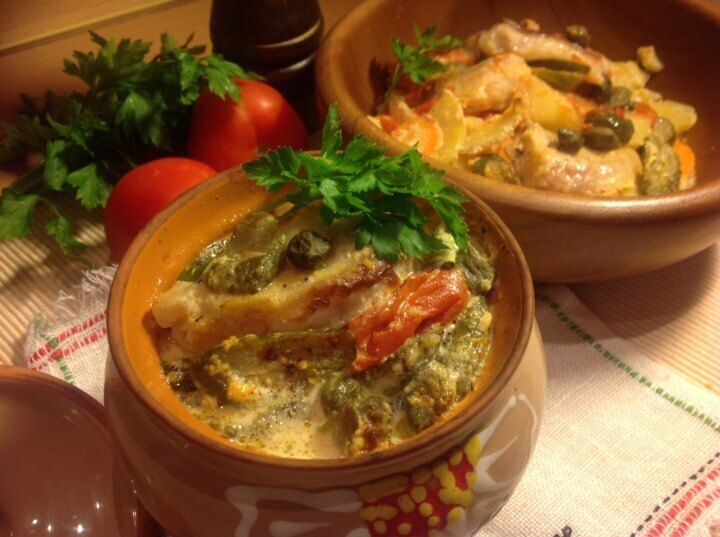 Today we are going to follow the old recipe and serve tender plaice with vegetables in pots. 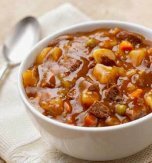 In addition this dish is low in calories and healthy. 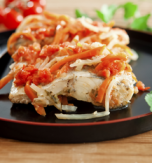 The crock pot plaice and vegetables will love all your guests. Peel and chop a bulb onion finely. Preheat dairy butter in a skillet and sauté the onion. Peel a carrot and potatoes. Rinse and slice the vegetables thinly. Take 3 crock pots. Place the onion on the bottom of each crock pot. 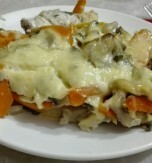 Put the slices of the potato and carrot above. Sprinkle the ingredients with salt, pepper and paprika. Pour half of the cream over the ingredients. Cover the crocks and place them in a preheated oven for 20 minutes. Wash plaice, scale it and cut into medium pieces. Rub the fish with salt and pepper. Cut tomatoes and pickled cucumbers into circles. Transfer the pots to a table. Check the vegetables. They should be already cooked through. Arrange the tomatoes above and drizzle everything with tomato sauce. Then put the plaice and pickled cucumbers. Next pour the remaining cream over the ingredients. Cover the crocks and place them in the oven. Bake the dish at 200°C (392°F) for 20 minutes. Do you have a favorite Ukrainian recipe for baked fish with veggies? If so, please let us know in the comments below or write us an e-mail.